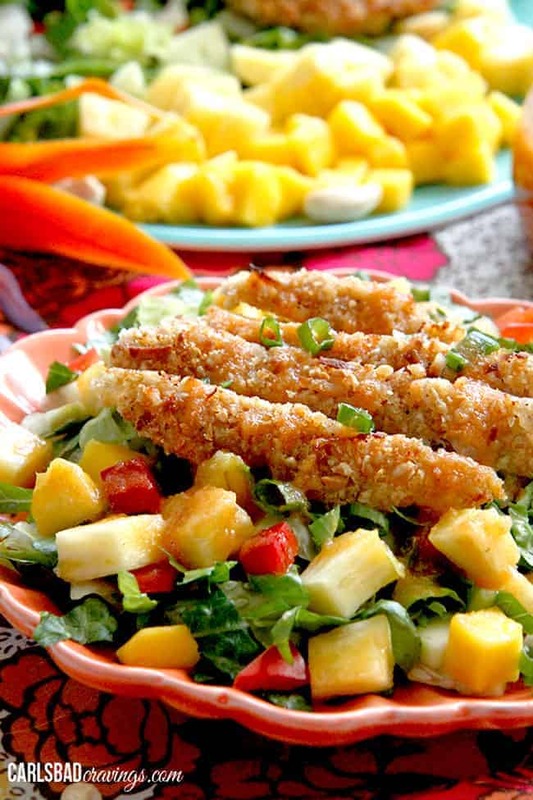 Cashew Chicken Salad with juicy coconut, cashew crusted chicken, pineapple, mangoes, cucumbers, lettuce, green onion and red bell peppers and Pineapple Ginger Vinaigrette! 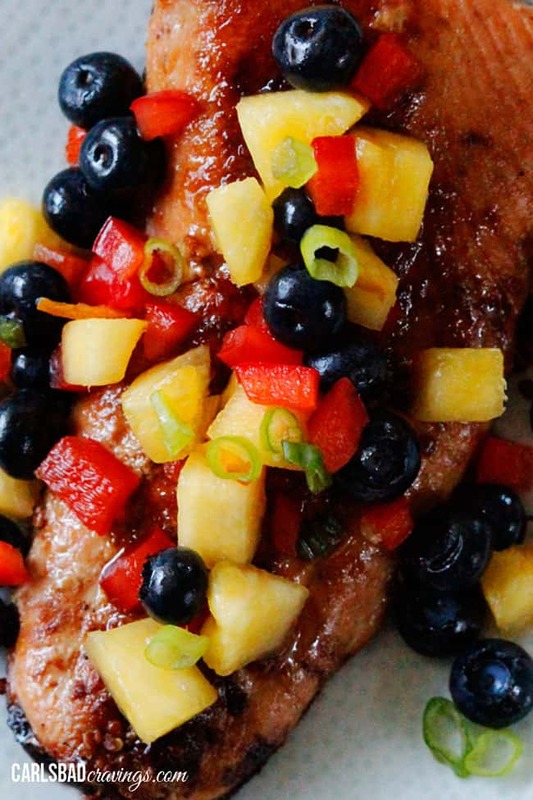 This Cashew Chicken will transport you to the tropics with its paradisaical flavors and textures and you’ll never want to come back! September has always been one of my favorite months. Its still gorgeous outside, the tourists are gone (not that we don’t love you!) and you can begin to get excited for the holidays, without having to stress about the holidays. So while other bloggers will shower you with fall recipes in September, to me, its like putting Christmas displays up in August, I just can’t do it. I just can’t post pumpkin cupcakes (even if they are the most delicious pumpkin cupcakes you have ever tasted) when I still have sand in between my toes. And that is why you are getting a taste of the tropics with this Cashew Chicken Salad in September. Although I might shower you with a few more “summery” recipes this September, I promise when Fall really comes (well it never really comes in San Diego), I’ll be filling your tables with tasty soups and pumpkins galore, but for now, I hope you still feel like tasting summer just a little bit longer, especially when it tastes like Crispy Coconut Cashew Chicken Tenders. 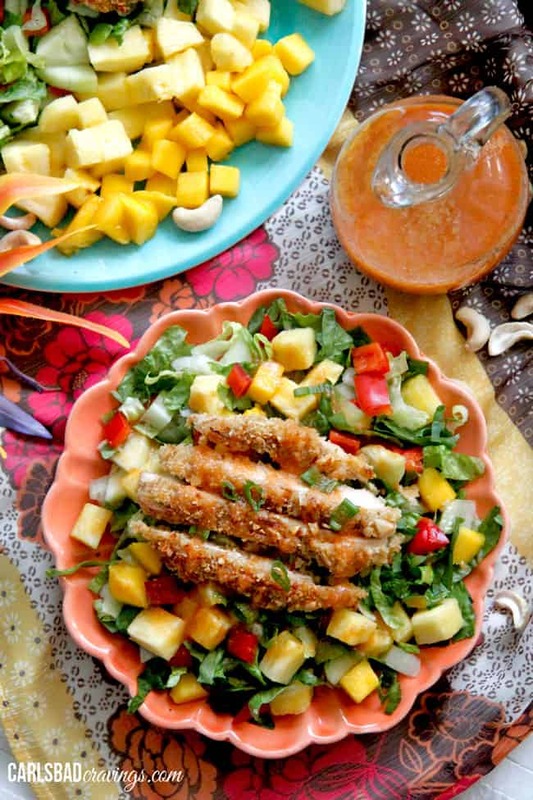 I made my Crispy Coconut Cashew Chicken Tenders with Honey Mango Dip with this exact Cashewe Chicken Salad in mind. 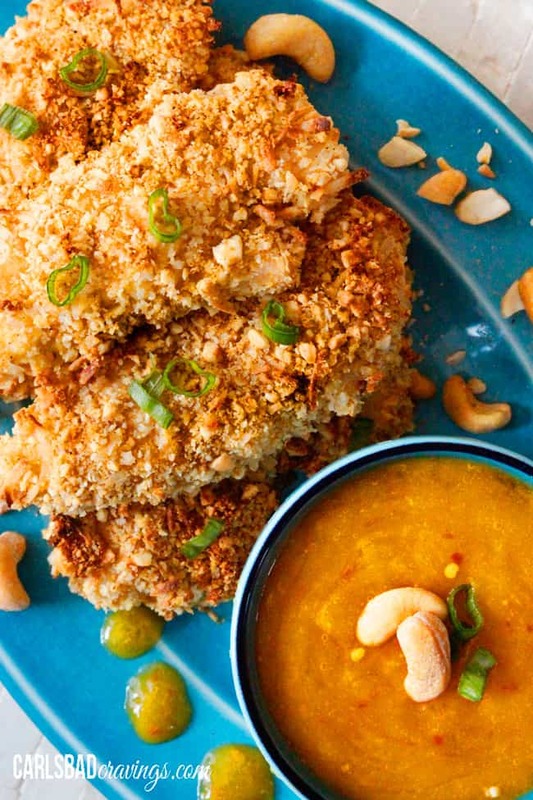 Juicy chicken crusted in cashews, coconut and panko spiced with cumin, cayenne, garlic and onion and sweetened with the coconut and brown sugar. The perfect blend of sweet and spice, crunchy outside, tender inside. 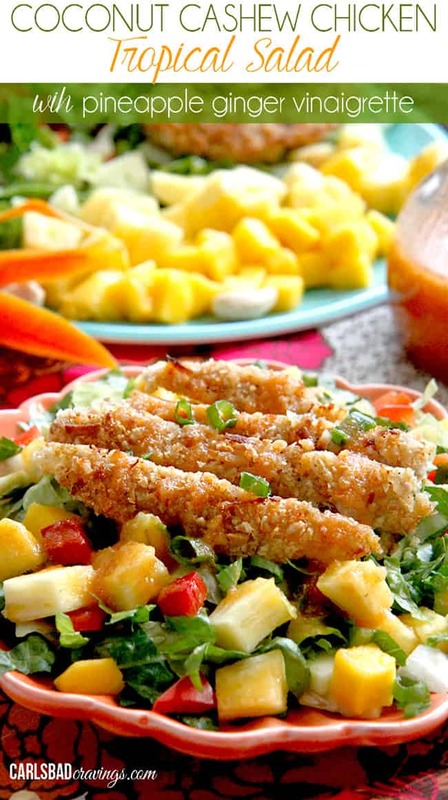 This crispy coconut cashew chicken lays on a throne of pineapple, mangos, cucumbers, lettuce, green onion and red bell peppers – AKA crunchy, juicy, sweet, tangy all in one bite. And if you are intimidated by cutting mangos – do’t be, just check out my How to Cut A Mango Post that teaches everything you could ever want to know about mangos! And then there’s the Pineapple Ginger Vinaigrette! This dressing is almost too delicious to handle. It’s comprised of fresh pineapple, fresh ginger, garlic, honey, apple cider vinegar, oil and paprika – truly a dressing to live for. Its sweet and tangy with a little attitude. This dressing should have its very own post. 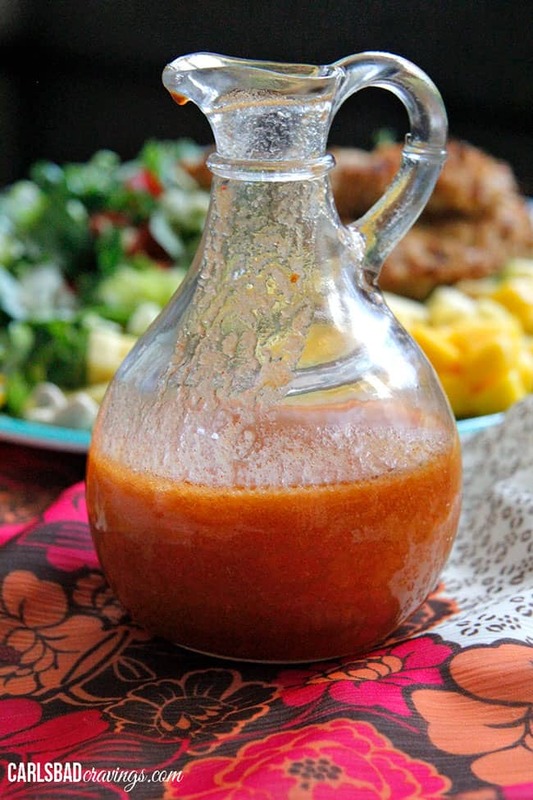 If you don’t want to make the whole salad, make this dressing! But really, you should also make this Cashew Chicken Salad of sweet fruit, crunchy vegetables, crispy chicken and heavenly vinaigrette. Make it while its still summer in September so you won’t have to wait for a whole year to go by. Because waiting is not fun. Summer in September never tasted so good! Cashew Chicken Salad with juicy coconut, cashew crusted chicken, pineapple, mangoes, cucumbers, lettuce, green onion and red bell peppers and Pineapple Ginger Vinaigrette! This Cashew Chicken will transport you to the tropics with its paradisaical flavors and textures and you'll never want to come back! Prepare Crispy Cashew Coconut Crusted Chicken according to recipe. Cut into strips when slightly cooled. 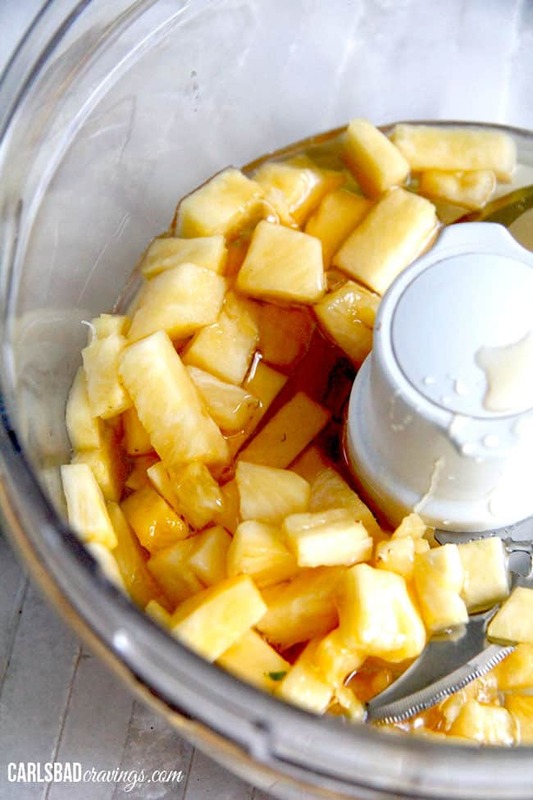 Toss all the salad ingredients together or toss vegetables then add pineapple, mango and avocado to individual servings if you know there will be some left (so you can save separately). Drizzle individual servings with dressing (you don't need a lot). Enjoy! *Coconut Cashew Chicken Recipe makes 12 chicken tenders so depending on personal preference of chicken to salad ratio (and how "hearty" you want your salad), you can make half or the whole recipe. All of these flavors cream deliciousness! Oh my gosh, what a cute puppy too! What a gorgeous recipe! I love Kiwi! He is so cute. 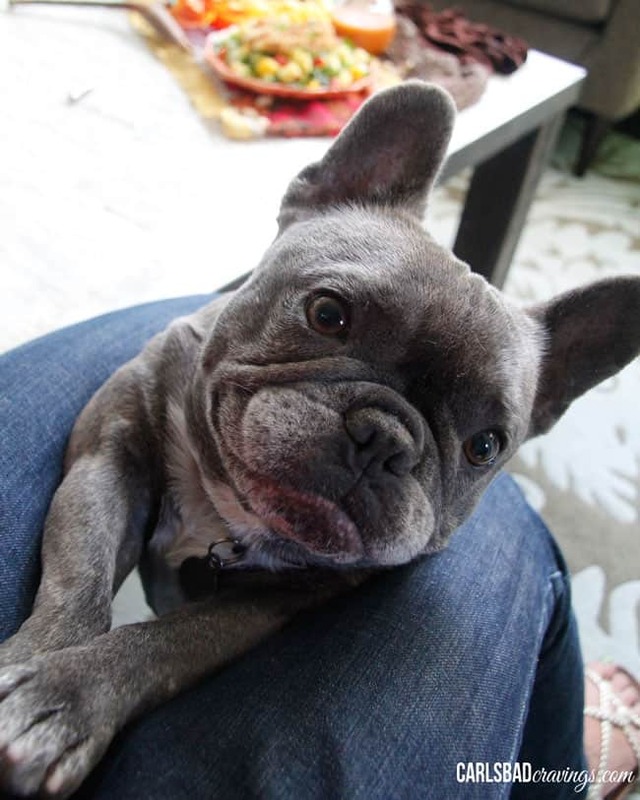 We’ve got a couple of things in common – I live in California too (Northern) and I love squish faced doggies 🙂 I can’t get over how cute your pup is. This salad is my idea of the perfect meal! Vibrant, fresh, and delicious. 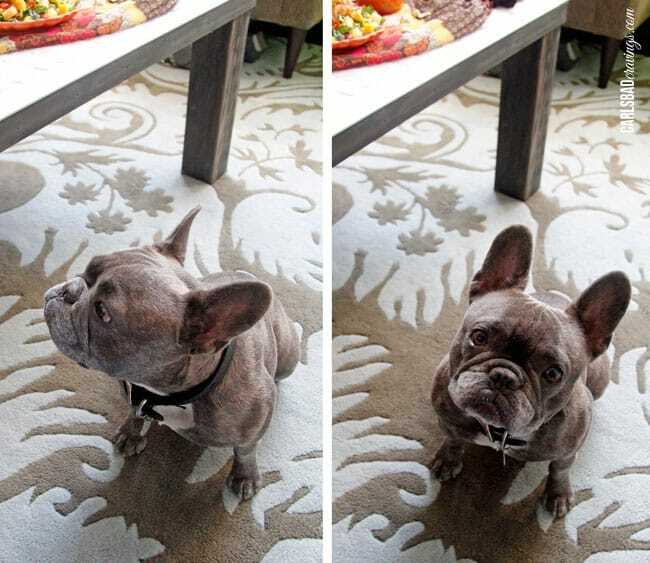 Oh Jen, can I just live in your house and play with your cute dog, and get fed by you daily? And those photos! I mean seriously. Drooling! Made this tonight and loved it 🙂 thanks! Awesome, so happy you loved it Kim! That makes me happy :)! xoxo!